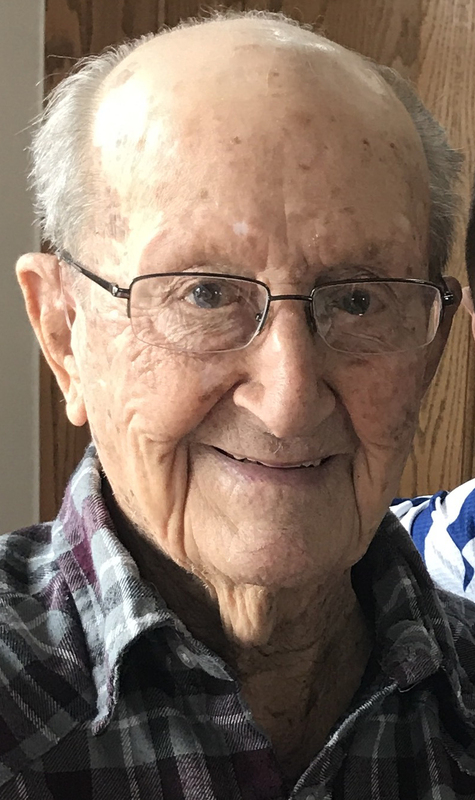 Owen Sharp, 98 of Taylorville went home to be with the Lord 11:34 a.m. on Monday May 14, 2018 at St. John’s Hospital in Springfield, Illinois. He was born April 11, 1920 to parents John W. and Maude (Driskell) Sharp in Edinburg, Illinois. After school, Owen served from February 18, 1942 to December 26, 1944 in the US Army 36th Infantry Division during World War II where his selfless efforts throughout Africa, Italy and France lead to the liberation of Europe. This decorated war hero served with distinction then returned home to be a successful farmer just north of Taylorville. He married Marian (Prater) Sharp December 16, 1945 and was blessed with a family that flourished several generations. Not only a farmer, a storyteller, and a landmark of the Christian County people who put others before himself, Owen was a pillar most proud of his loving family with whom he spent much time making memories and guiding them with timeless life lessons. He was a member of Taylorville Christian Church. He is survived by children: Wayne (Cheryl) Sharp of Taylorville, Marilyn (Rich) Payne of Taylorville, Linda (Cliff) Mansfield of Taylorville; grandchildren: Bryan (Betsy) Sharp of Taylorville, Ryan (Brandon) Wingard of Mahomet, Andrea (Steve) Younker of Taylorville, Lacy (Taylor) May of Taylorville, Ali (Brent) Riva of Taylorville, Lauren Mansfield (Ed DelValle) of Taylorville. Great-grandchildren include: Owen, Wyatt, and Levi Younker; James and Clint May, Lane and Cooper Riva; Mia DelValle, Nora Sharp and good friend Ruth Weiser. He was preceded in death by his wife of 49 years Marian (Prater) Sharp, his parents, brothers Bill and Dorritt, and his Sister Edith. Visitation will be held on Friday, May 18, 2018 from 9:00-11:00 a.m. at Sutton Memorial Home in Taylorville, IL. The funeral will follow the visitation on Friday, May 18, 2018 starting at 11:00 a.m. at Sutton Memorial Home in Taylorville, IL with Rev. Tom Belegante officiating. Burial will be held in Edinburg Cemetery in Edinburg, IL with military graveside honors. Memorials may be made to Vision Way Christian School 1124 N Webster St, Taylorville, IL 62568 or American Legion Post #73 110 W. Franklin St., Taylorville, Illinois.